Blog posts on Greenwich.co.uk that mention or are related to historic Greenwich Market at the heart of maritime Greenwich. Greenwich Market is owned by the Greenwich Hospital naval charity. GREENWICH Market bosses have told traders there will be no start to its controversial redevelopment for at least another year. The news was delivered by Edward Dolby, Resources Director at Greenwich Hospital, at a recent meeting with traders, held at the Trafalgar Tavern. The naval charity, which owns large parts of Greenwich town centre, committed itself at the meeting to giving all commercial tenants twelve months' notice before beginning works. When Greenwich Hospital won its planning appeal to go ahead with the scheme, it was anticipated that the project would get under way in January 2013. The delay is good news to some traders who feared for their place at the market during, and after, the regeneration. John Dawson, who runs a spanish food stall, welcomed the news and told this website it was a "huge relief." The market revamp which includes a new 99-bedroom boutique hotel had been unanimously rejected by the Greenwich Council's Planning Board, but the decision was overturned by an independent planning inspector. Mr Dolby told Greenwich.co.uk, "We are continuing to take strategic advice on the best method of moving the market regeneration forward in these very challenging times." Greenwich will once again play host to a farmers' market as of next month. City & Country Farmers' Markets are returning to Greenwich in October with a new location right in the heart of the town centre. The traders will set up their stalls in Durnford Street, between Greenwich Market and Greenwich Church Street. The announcement was made on City & Country Farmers' Markets' Facebook page. "We looked at various venues and found nothing suitable - but then Greenwich Market contacts us and offered us ... the location! We were initally a little uncertain as central Greenwich is a touristy area, however we have a great deal of support from locals as well as a prime location so are very confident it will work." Previous attempts to launch the market at East Greenwich Pleasaunce and at Halstow School proved to be unsuccessful. The new farmers' market in Durnford Street begins on the weekend of October 15th and 16th. Popular Greenwich Market trader, Ms Cupcake, has been left devastated after being told by market bosses she can no longer trade at weekends. The baker, who promises "the naughtiest vegan cakes in town", had hoped to carry on trading at Greenwich Market whilst also expanding the business into new premises at Brixton Market. An email from market bosses assured her that if she did "decide to open elsewhere we would be more than happy for you to continue with your stall on the market for whichever days you wished to trade." Earlier this month, business owner Mellissa Morgan announced her expansion plans - only to get the shock news that Greenwich Market was axeing her from her weekend pitch. "Ms Cupcake" says the decision will have "huge financial repercussions" for her business and that she will no longer be able to recruit five new members of staff she had planned to. 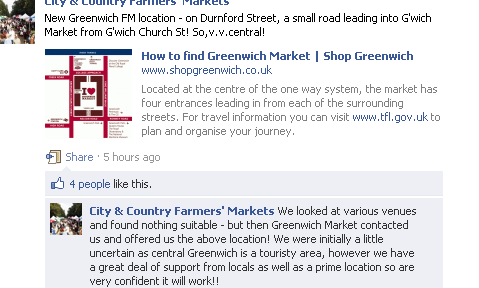 "All we have ever done is promote Greenwich and the market and loved every minute we were there. This is the biggest slap in the face I could ever imagine", she said. "I really don't understand why a thriving, vibrant stall such as this is having its hours cut in such a drastic and, dare I say, draconian way. Only being allowed to trade on a Friday, and having your regular customers from the usual Saturday and Sunday markets deprived of their 'fix', seems very short sighted on the behalf of the powers that be." "Because of the ongoing review of the food stalls at the market, we decided to revert to the pre-November trading pattern which allows Ms Cupcake in the week and Ruby Tuesday [who also sells vegan cupcakes] at the weekend." Ms Cupcake will be opening the new Brixton shop in April - get more information about that and where she will be trading until then at her website. Greenwich.co.uk understands that the shock plan to cut the number of food stalls which was announced to traders last summer may not now be proceeding as originally planned. The proposal, which provoked an angry response from traders, to reduce the number of hot food stalls within the market and to move those remaining into a retail unit is being reviewed by Greenwich Hospital. Controversial plans to redevelop Greenwich Market and build a new boutique hotel have been given the green light. The proposals were orgininally rejected unanimously by councillors on the Greenwich Council Planning Board but landowners, Greenwich Hospital took their revised plans to a public appeal. Following a public inquiry, with hearings held at Woolwich Town Hall last September, the planning inspector has recommended that permission be granted. His conclusions have now been backed by Local Government Secretary of State, Eric Pickles. The Planning Inspector considered both the original application and the revised scheme, designed by Hopkins Architects, put forward by Greenwich Hospital. He agreed with many of the objections to the original proposals and stated that they would have been harmful to the character and appearance of the conservation area. But in looking at the the revised plans, which dropped plans for a canopy roof and retain the market's cobbles, the Inspector concludes that the "universal value, integrity and authenticity of the World Heritage Site" would be conserved by the regeneration. He adds that the scheme would "preserve the setting of nearby listed buildings". The banana warehouse and stable buildings in Durnford Street will be demolished as part of the revamp. The inspector admits they have a "degree of charm and character" but points out listed building building consent for their demolition has already been granted. The 99 bedroom hotel, split across two buildings with the market in between, will be run by Bespoke Hotels, who also operate the Bermondsey Square Hotel, and is expected to create 86 full-time-equivalent jobs. A new crescent street will be created leading from Durnford Street to the market which the inspector describes as as "imaginative and acceptable additional chapter in the market area's evolution" that would provide "variety and interest". 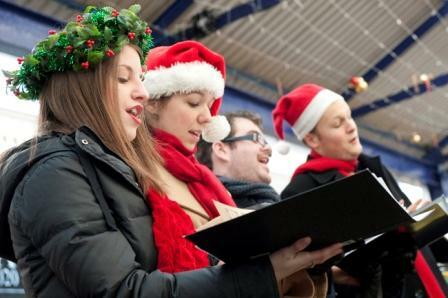 The redevelopment of the market, which has been strongly supported by the Greenwich Society and local MP, Nick Raynsford, will not begin until January 2013 at the earliest and traders will move to a new temporary market at Monument Gardens whilst the redevelopment is undertaken. Martin Sands, Director of Greenwich Hospital, welcomed the news as a "a positive result for Greenwich Hospital and for the centre of Greenwich." He added, "The Hospital believes that the approved scheme, which includes minor amendments, will maintain the character and atmosphere of the current market within a refurbished environment." Speaking to Greenwich.co.uk, Nick Raynsford MP said he was "delighted that consent has been given". Although a supporter of the original application, he praised Greenwich Hospital for its "pragmatic decision" to "amend the scheme in response to genuine concern.". He added that the redevelopment would "protect and ensure the long term future of the market". The Chair of Greenwich Council’s Planning Board, Cllr Ray Walker, has hit out at the decision and labelled the development as a "scheme totally out of keeping with the history and architecture of Greenwich Town Centre ... which simply is not of a sufficiently high standard for a World Heritage Site." He attacked the Government's decision to back the scheme and their pledge towards greater "localism" carried "little actual meaning." For critics of the scheme, options to fight the ruling are limited to an appeal in the High Court or a Judicial Review. Ray Crudgington, head of Commercial Property and Managing Partner at Grant Saw Solicitors LLP in Greenwich commented, "I suspect this decision will be very, very, difficult and expensive to appeal against." Once built, the Greenwich Market Hotel will be operated by Bespoke Hotels. This is a positive result for Greenwich Hospital and for the centre of Greenwich. The Hospital believes that the approved scheme, which includes minor amendments, will maintain the character and atmosphere of the current market within a refurbished environment. This decision recognises the standard of design employed by Hopkins Architects and their success in creating a scheme that responds to the constraints of the site yet remains sympathetic to the surrounding architecture. Greenwich Hospital will consider the detail of the consent granted with its professional advisers to decide how best to take matters forward. In any event Greenwich Hospital will not consider starting the market regeneration before January 2013, following the first Christmas after the Olympics. Our programme of planned maintenance will continue this year as planned with the redecoration of the Hospital’s properties in Greenwich Church Street and all other refurbishment projects will continue as planned. fully engaged in the future of Greenwich. In fact, it is very much business as normal". “It is regrettable that the new Secretary of State, apparently pledged to a greater degree of localism, has chosen to overturn the unanimous decision of the Council to reject the planning application for Greenwich Market. Localism is a word which seems to be increasingly deployed but carries very little actual meaning for the Government. This appeal gives the green light to a scheme totally out of keeping with the history and architecture of Greenwich Town Centre and which simply is not of a sufficiently high standard for a World Heritage Site. It is particularly unfortunate that the application will permit the Greenwich Hospital Estate to demolish the heart of Greenwich Town Centre just as we have shown off all its charms to the millions of visitors in 2012 and who, instead of being encouraged to return, will avoid the building site that the Greenwich Hospital Estate will turn the town into”. 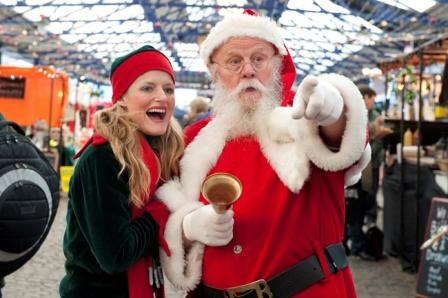 Father Christmas was the star guest at Wednesday afternoon's Christmas "Light's On" event at Greenwich Market. 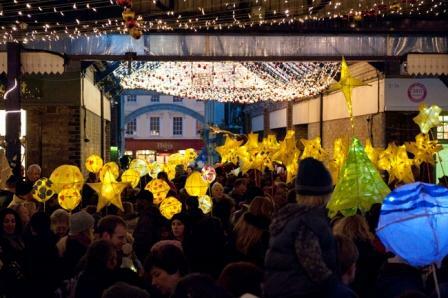 Kids from local schools took part in a lantern parade followed by Christmas carols in the covered market. Here's a selection of official photographs from the event. Something, or someone, seems to have caught Santa's eye in this. Feel free to volunteer your own captions! For around two hours on Sunday afternoon Greenwich town centre was eerily free of traffic as emergency service units descended on the Admiral Hardy pub on College Approach. At around 2.50 pm Creek Road was closed between the Norman Road junction and Greenwich Town Centre. College Approach was also closed as around six fire crews, an incident support unit and a scientific support unit attended a chemical incident at the Admiral Hardy public house. Metropolitan Police and the London Ambulance service also attended the scene in volume. The London Ambulance service received the first report at 2.20 PM with a single responder and hazardous area response team attending first. Four adult males were assessed on scene for inhalation of fumes and were transported in a single ambulance to Queen Elizabeth Hospital, Woolwich, for further assessment. A spokesperson for the London Fire Brigade confirmed that an unknown quantity of floor cleaner and bleach had been mixed and firefighters attended the scene with specialist detection equipment but did not find any elevated levels of a dangerous chemical. College Approach and Creek Road reopened at 4.30 PM. The proposed Greenwich Market redesign would see new buildings of "character and potential historic significance", a planning inquiry heard today. That was the verdict of Dr Jonathan Edis who was called as a professional witness by Greenwich Hospital. Dr Edis said that the market buildings dating from the 1950s do not "really hang together" with the rest of the market and are "not worthy of preservation". He added that the scheme would see "no loss of significance" and would instead create an "attractive way of drawing people into a new and vibrant space". He was asked if he knew why Bespoke Hotels, the selected operator for the hotel if it gets the green light, had produced a web page advertising the hotel including "an alfresco restaurant-bar set amidst the cobbled courtyard" but Dr Edis said he had no knowledge of that. The lawyer representing the council suggested to Dr Ediz that in his written submissions he had tried to "create an argument" with the council's Senior Conservation Officer, Rebecca Duncan, and he was in fact a "hired gun". Dr Edis is a former local authority conservation officer himself and now runs his own cultural heritage consultancy. Other developments from the inquiry's fifth day included the Planning Inspector announcing that he will make his own unaccompanied visit to the market on Saturday. The inquiry schedule includes an accompanied visit on Thursday but market trader, Kate Jaconello, suggested earlier in the week that he visit at a weekend which he has now agreed to do. The inquiry continues at the town hall on Wednesday, the site visit due to take place on Thursday and closing submissions on Friday. 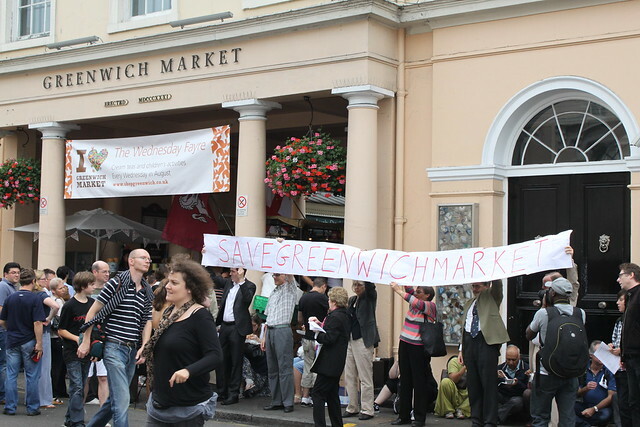 Proposals to redevelop Greenwich Market will "rip the heart ouf of Greenwich", a local councillor told an independent public inquiry into the market's fate today. Cllr Maureen O'Mara (Labour, Greenwich West) said that the market is a "well loved part of London" and that it would be a "disgrace to allow it to be destroyed". The councillor has served on the Greenwich Area Planning Committee since 1998 and was the Chair of the Borough Wide Planning Board between 2002. She explained that she had originally been involved in the Key Stakeholder Group that was discussing plans for the redevelopment but that she pulled out when she saw the scope of their plans. She said that the Market owners, Greenwich Hospital, have never shown "any understanding or interest in the impact of their proposals on this sensitive location". Cllr O'Mara ended her comments to the inquiry, which started on Tuesday and is now in its third day, by requesting that the Secretary of State for Local Government, who has the final say, reject the appeal. The afternoon's session was mostly taken up by questioning of Greenwich Council's Chief Planning Officer, Fred Brown. 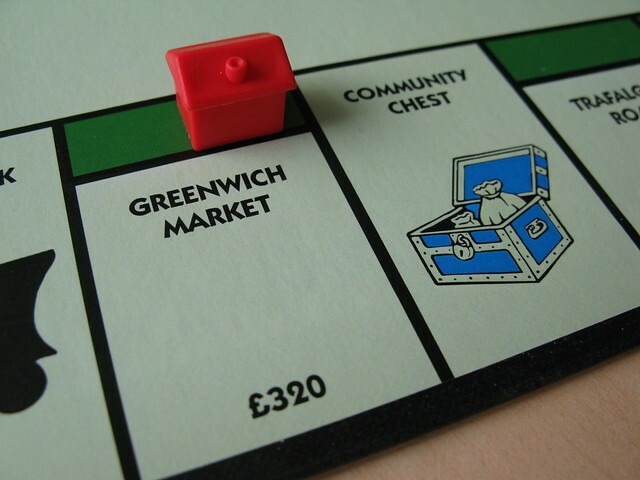 Mr Brown acknowledged that the Greenwich Market site "needs investment" and conceded that the development had the "potential" to bring benefits, such as additional employment, but said there was a "question mark" over whether the changes would benefit residents and traders. He said that the proposed boutique hotel "would not fill a gap" as there were other high quality hotels in Greenwich, specifically citing the Devonport Hotel and the Novotel, and more hotels were already planned. "Mr Raynsford is not an urban planner so is not qualified to make those judgements"
He was questioned by Greenwich Hospital's QC, Neil King, about the support for the scheme from local MP Nick Raynsford, the Greenwich Society, the University of Greenwich and ICOMOS (International Council on Monuments and Sites). When asked about Nick Raynsford's support for the scheme, Mr Brown commented that "Mr Raynsford is not an architect, he's not an urban planner so is not qualified to make those judgements". Mr King QC seized on that and asked Mr Brown if indeed he was a qualified architect or urban planner either. "No", replied Mr Brown, although he did point out his experience of over twenty years in managing planning departments. The inquiry continues on Friday and from Tuesday to Friday next week.